Showing 46 articles from May 23, 2018. LOUISBURG -- Town residents will see their town property tax rate drop next year, although their actual tax bill probably won't reflect that change. The town is considering a "revenue neutral" rate of 45 cents per $100 of valuation, down from this year's 49.5 cent tax rate. A formal vote on the budget is expected on June 18. LOUISBURG -- The only comment that the county's proposed budget drew during a public hearing on Monday night was praise from the school system's superintendent. The conversation about Franklin County's 2018-19 budget is expected to continue, though, up until its adoption -- which has to take place by June 30. 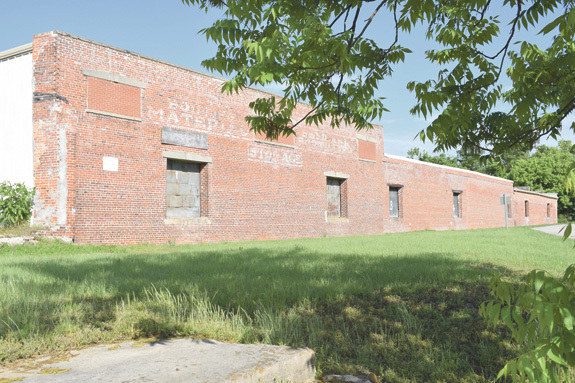 LOUISBURG -- The ambitious and much-discussed "Depot Hill" project in Louisburg took a giant step forward this week when Dawn Dickens, representing the Dickens family, donated the old depot building and 1.5 acres to the town. The only stipulation made, according to Louisburg officials, was that the Dickens name be worked into the name of the finished development, a stipulation that the town unanimously accepted. LOUISBURG -- A veteran town staff member and a familiar face around town has a new job title plus added responsibilities following this week's town council meeting. 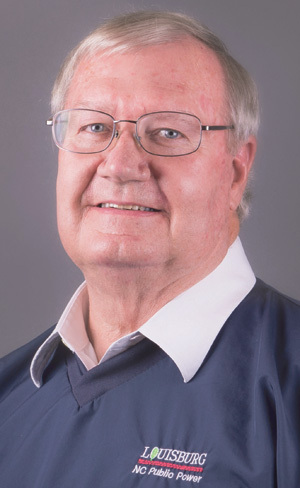 Long-time Utilities Director Ray Patterson is now Assistant Town Administrator of Operations Ray Patterson -- and he had new duties as well. LOUISBURG -- Franklin County's airport advisory board doesn't meet until next month, but airport operations were a topic of discussion at the county commission meeting on Monday night. In February, the airport's governing board agreed that it would change from a commission to an advisory council -- meaning county staff and officials would be responsible for the day-to-day operations of Triangle North Executive Airport. Teachers: Your problems aren't just in Raleigh! When Franklin County teachers, most all decked out in red, marched in Raleigh last week, there were reasons to both cheer and jeer, depending on your political perspective and the value you place on public education. As for me, mostly I cheered -- but not necessarily for the reasons you might expect. One proposed fee hike in Franklin County's budget for 2018-19 could turn out to be a significant boost for the town of Louisburg's effort to increase residential construction. Included in the draft of the county's new budget is a very significant increase in "tap on" fees for county water and sewer services. It would have been easy to do, especially after hopping on a 4-and-a-half hour flight, jetting through four time zones and landing in Sin City. 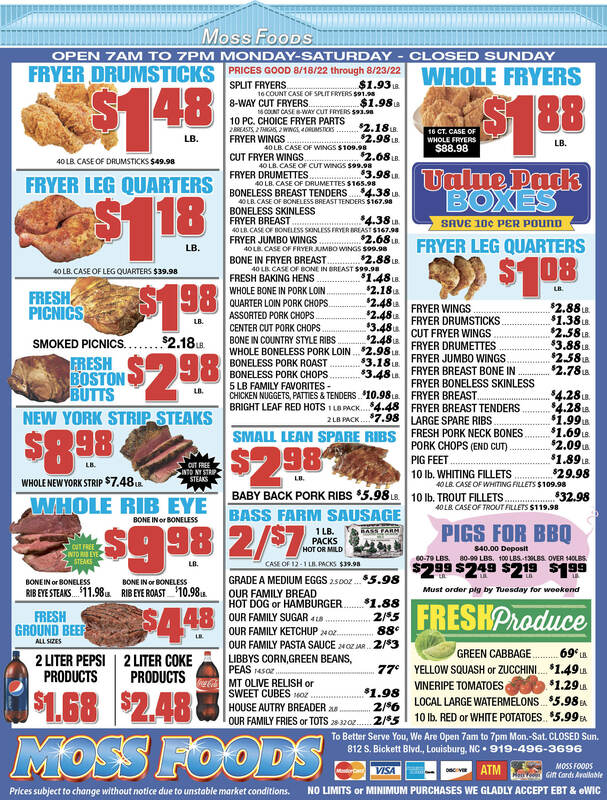 But, somehow, while moving in and around Las Vegas, many of my thoughts drifted back to Franklin County. Believe me, I know what you're thinking: "You were in one of the greatest cities in the world and you're thinking about little old Franklin County? That's strange." This is the second column of a planned series on bringing broadband to Franklin County. Hindsight and foresight will always inform those with vision. A student of leadership and management in the military, corporate America, and the political arena, I have found many similarities. LOUISBURG--Funeral services for Mae Etta Crudup, 91, who died Monday, May 21, 2018, will be held Saturday, May 26, at 3 p.m. at Gethsemane Missionary Baptist Church in Bunn, with Dr. Johnny Hill officiating. LOUISBURG - Matthew "Matt" Shane Whitley, 40, of the Justice Community, passed away Tuesday morning at his home surrounded by his loving family after a four-year fight with Pancreatic Cancer. 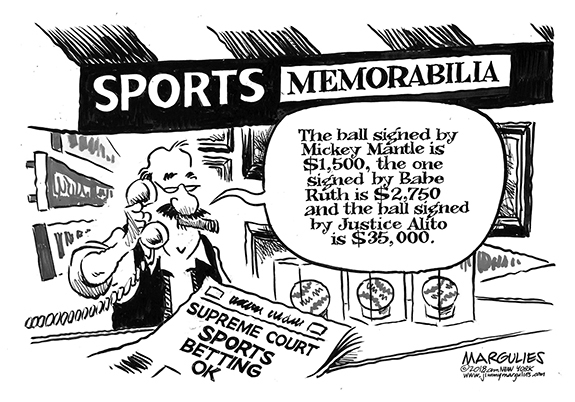 As Matt's favorite saying would be "IT IS WHAT IT IS." KITTRELL--Funeral services for Simeon P. "Sim" Kingsberry, 83, who died Thursday, May 17, 2018, will be held Saturday, May 26, at 12 p.m. in the Richardson Funeral Home Chapel in Louisburg. Burial will follow in the Kingsberry family cemetery. EYE ON THE BALL. 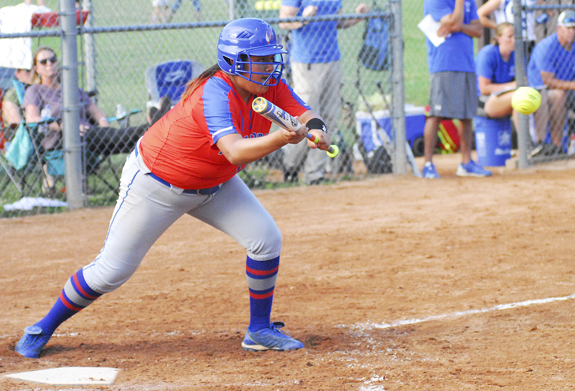 Louisburg High School's Brenda Mata attempts a sacrifice bunt during her club's extra-inning playoff softball conquest Tuesday at home against Camden County. LOUISBURG - For 13 innings, the duel raged on, filled with pitching heroics, self-assured field work and missed offensive opportunities from both clubs. Then, in a single instant, it was over. AND THE WINNER IS. 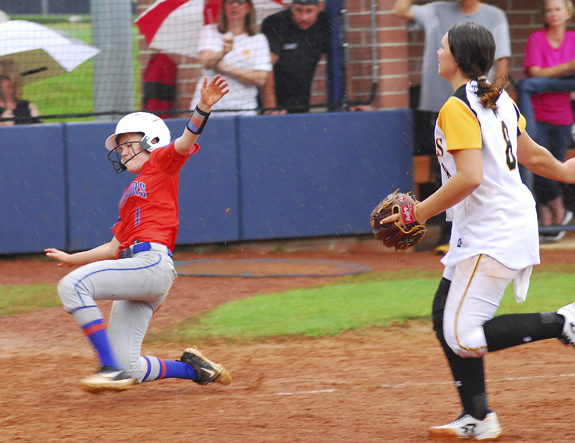 Louisburg High School's Madi Leonard scores the winning run during last Friday's playoff victory against Perquimans. 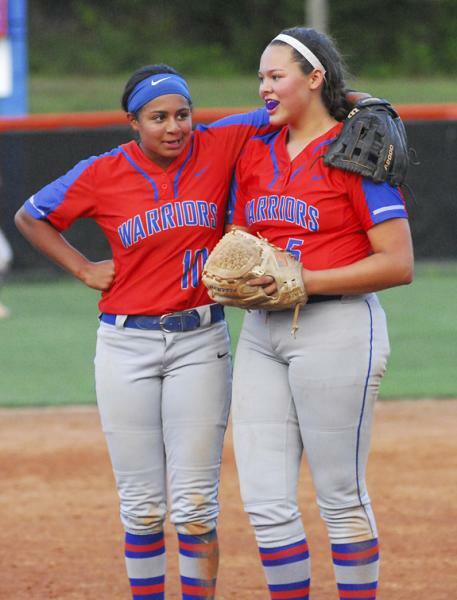 LOUISBURG -- After six challenging innings, everything seemed to fall into place for the Louisburg Lady Warriors during last Friday's Elite Eight matchup against Perquimans in the Class 1-A State Softball Playoffs. AT THE TOP. 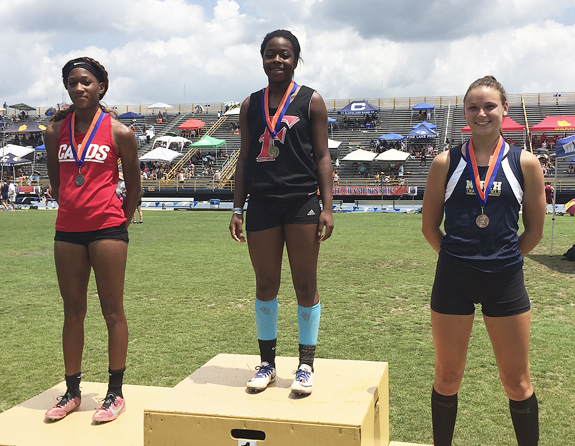 Franklinton High School's Shea Seward (center) accepts her first-place medal in the Girls Long Jump at the Class 3-A State Track and Field Championships in Greensboro. GREENSBORO -- Grand expectations follow Shea Seward wherever she goes on the track -- and that includes the grandest stage of all. 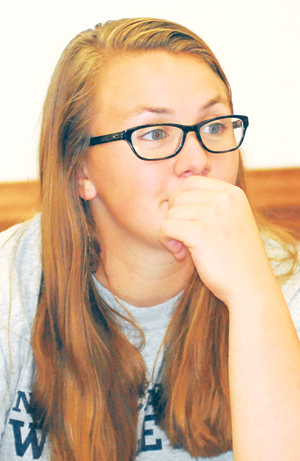 After a dominant regular season and title-filled heroics at the Big East Conference and Class 3-A East Regionals, Seward set her sights upon the top medals step at the Class 3-A State Track and Field Championships. 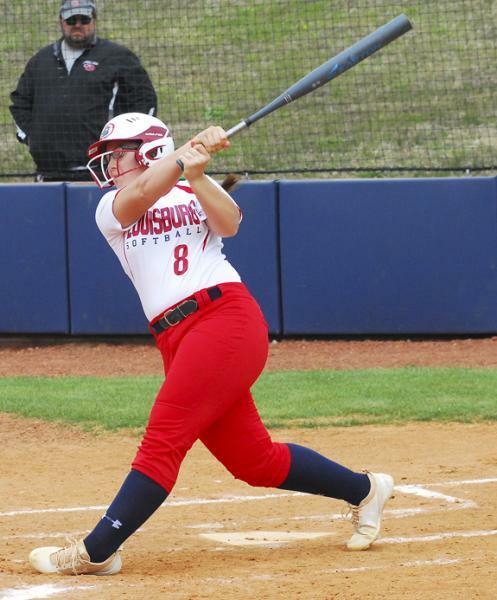 LOUISBURG -- For the past five years, Summer Phillips has been a dominant standout on the softball field in Franklin County -- first at Louisburg High School and then Louisburg College for a one-season stint. Phillips will now be taking her act on the road, though she won't be going too far away. GREENSBORO -- Shortly after graduating from the University of North Carolina-Chapel Hill in the late 1990s, David Neal laid the foundation for his coaching career at Louisburg High School. 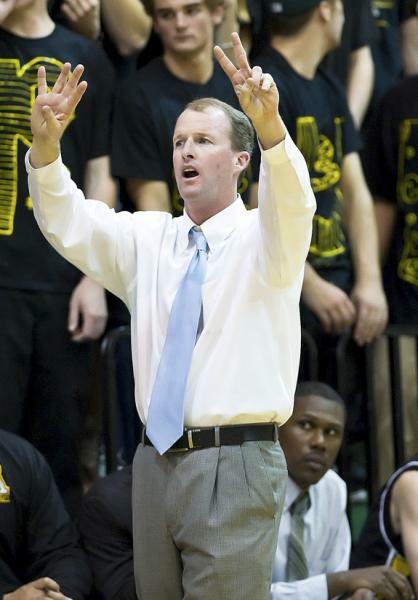 Neal guided the Warriors on the boys basketball hardwood before moving on to Apex, where he is regarded as one of the state's top hoops coaches. CLEARWATER, FLA. -- East Carolina University's Bryant Packard has been named American Athletic Conference Player-of-the-Year, while Alec Burleson was tabbed Freshman Pitcher-of-the-Year according to an announcement by the league off Monday afternoon. The Pirates also took home the Team Academic Excellence Award for the third-straight year after posting a 3.46 cumulative GPA. 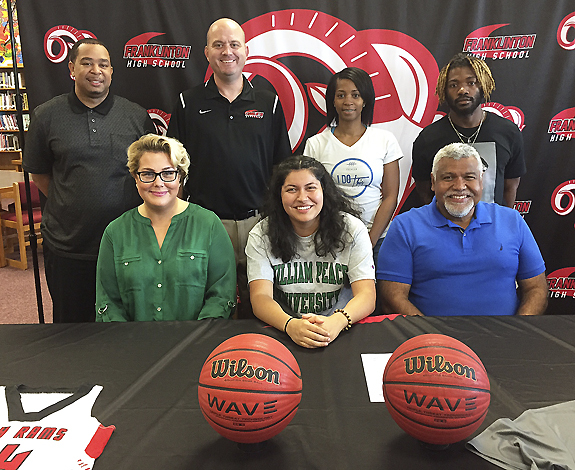 FRANKLINTON -- Numbers don't tell the full story of Isabel Nobles' contributions to the Franklinton High School girls basketball program. 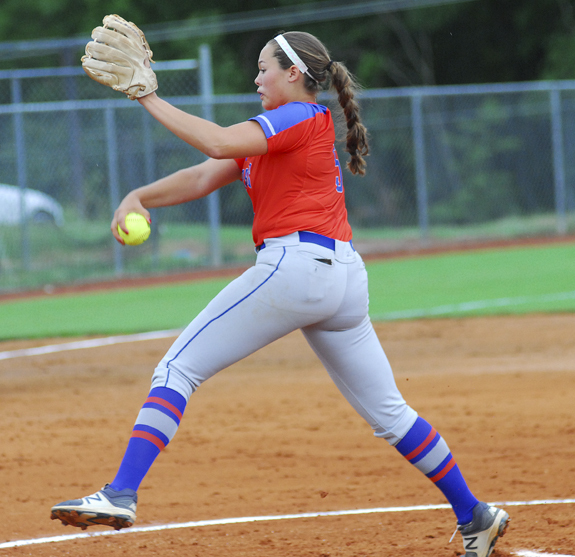 Nobles' statistics don't stand out, but her reliability and consistency played key roles in Franklinton's successful campaign this past fall under first-year head coach Matthew Hockaday. BUIES CREEK -- Ryan Aguilar went 3-for-5 with a RBI triple and Tucker Neuhaus went 2-for-3 with a run scoring triple of his own as the visiting Carolina Mudcats clinched their first series sweep of the season with a 9-1 throttling of the Buies Creek Astros at Jim Perry Stadium on Sunday afternoon in a Class A Carolina League baseball matchup. 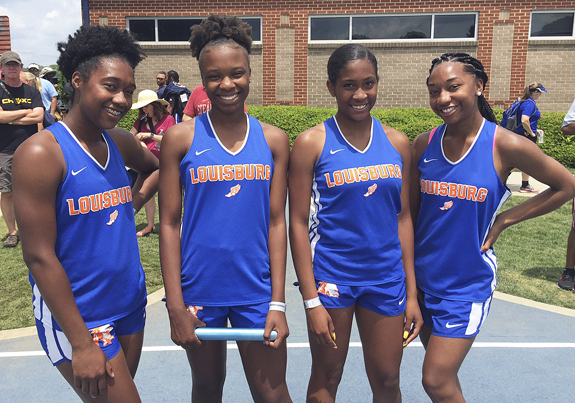 GREENSBORO -- The Louisburg High School Warriors continue to make progress with the rebuild of their boys and girls track and field programs. While LHS has fielded some strong individuals through the years, including the legendary Vanisha Wilshire, the current coaching staff has tried to promote overall depth within the program. 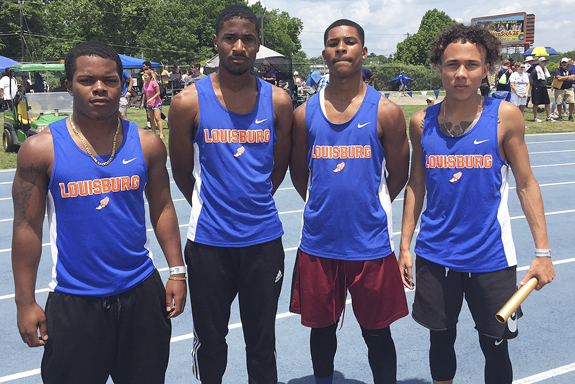 Members of the Louisburg High School Boys 400 Meter Relay Team from Sunday's Class 1-A State Track and Field Championships were (l to r) Xavier Jones, Tyree Yancey, T'Andre Davis and Jaden Brooks. The Warriors finished in seventh place at the annual event at Aggie Stadium on the campus of North Carolina A&T State University in Greensboro. Louisburg High School's Laine Barefoot delivers a fastball toward home plate during last Friday's victory over Perquimans at Louisburg College's Sheilah R. Cotten Field. (L to R) Kaylee Saunders and Laine Barefoot have been exceptional in the field and at the plate during the Class 1-A State Softball Playoffs for the Louisburg Lady Warriors. 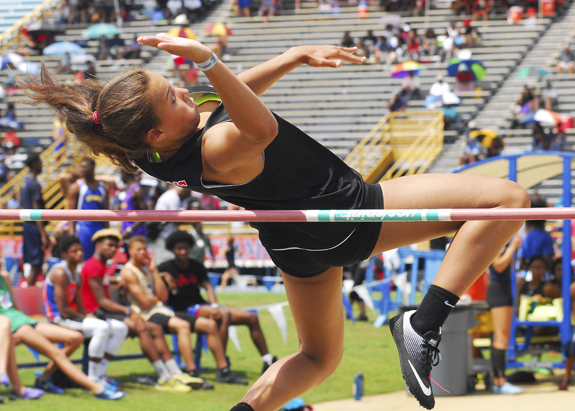 Franklinton High School's Rebekah Smith took fourth place in the Girls High Jump event at Sunday's Class 3-A State Track and Field Championships in Greensboro. 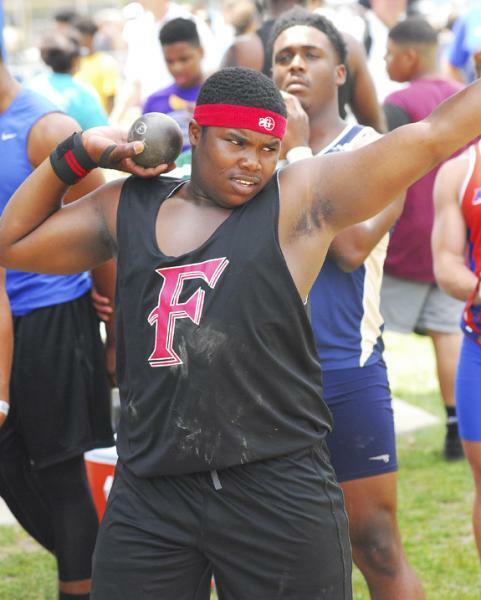 Frankilnton High School's E'Kwon White wrapped up his sterling athletic career for the Red Rams by taking part in the Boys Shot Put at Sunday's Class 1-A State Track and Field Championships at North Carolina A&T's Aggie Stadium. 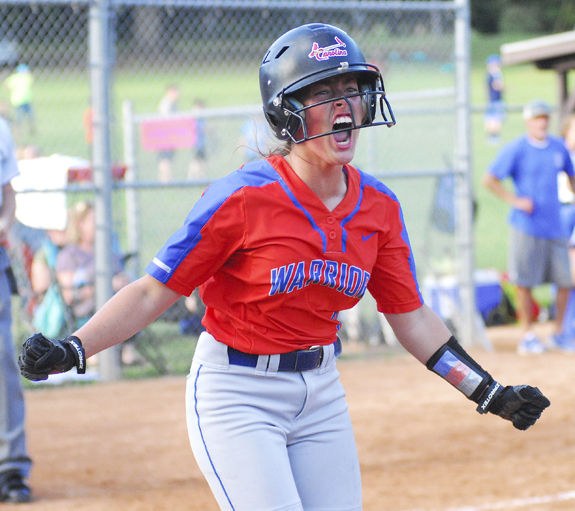 Louisburg High School's Ragan Holloman celebrates after scoring an early run for the Lady Warriors during Tuesday's decision over Camden County in the first game of the best-of-three East Regional Finals of the North Carolina High School Athletic Association's Class 1-A State Softball Playoffs. 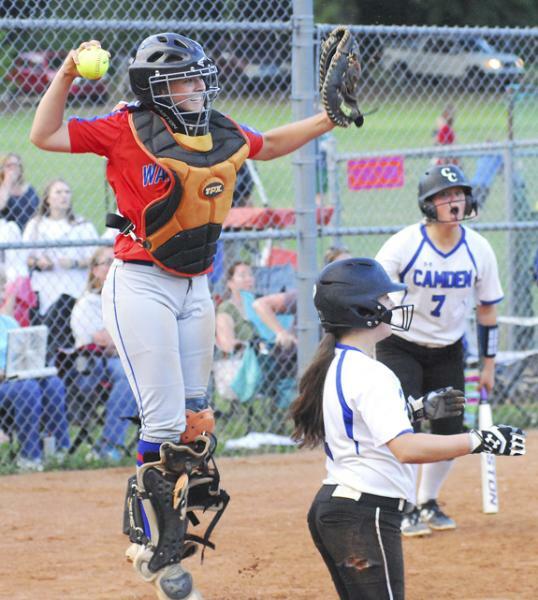 Louisburg High School's Chelsea Roberson (left) leaps into the air to celebrate a successful tag at home plate during Tuesday evening's decision over Camden County in the East Regional Finals of the Class 1-A State Softball Playoffs. 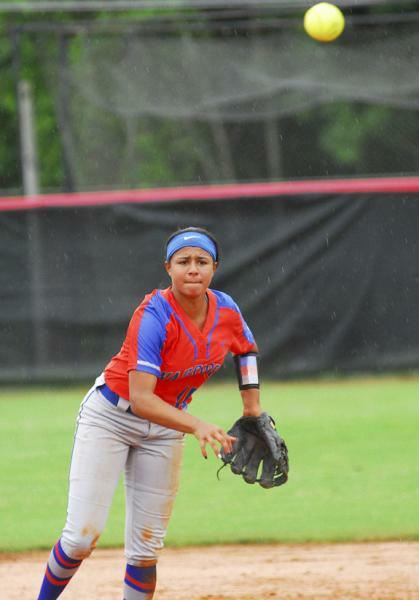 Louisburg High School shortstop Kaylee Saunders has made several amazing plays during the Class 1-A State Softball Playoffs. The Franklin County Arts Council's Writers' Guild is sponsoring its third annual FCAC Writers' Guild Carolina Prize in writing contest. It is open writers of any age and location for previously unpublished (This includes online publication) poetry, short stories, and essays or creative non-fiction. This year two prizes will be awarded, one for prose and the other poetry. Spring is upon us, and the world is mud luscious. 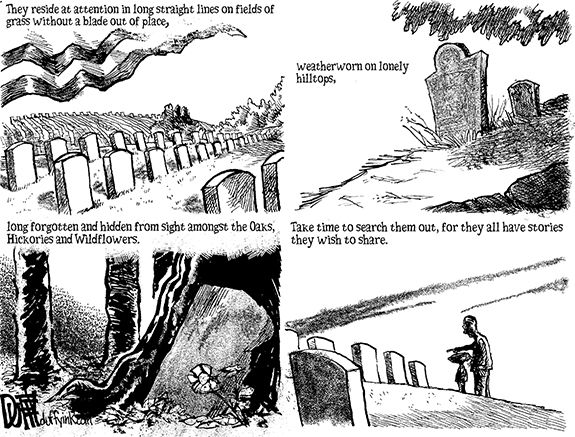 We walk across the soggy soil, and dream about the bounty it will soon yield. There is one problem though. We don't know what to plant, and we are in desperate need of direction on how to plant it and what to do with it when it grows. Thankfully, you can find the answers to these questions and many more at Field Days and Farm Tours that are brought to you by the North Carolina Cooperative Extension. 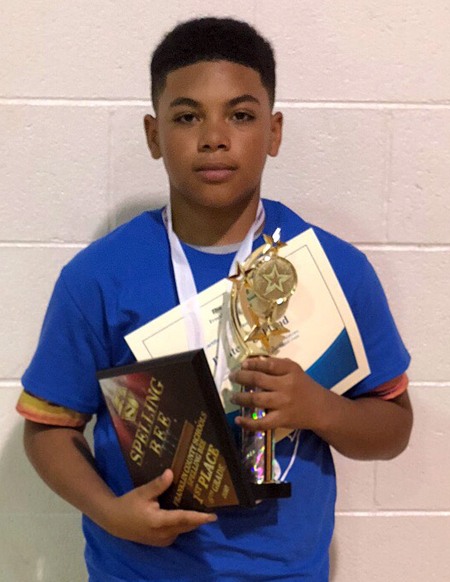 Donté M. Strickland Jr., a 6th grader at Terrell Lane Middle School, recently won the Franklin County Schools Overall Spelling Bee Competition, outspelling 4th-8th graders. He also won the overall competition his 4th grade year in 2016. In 2017, in 5th grade, he won for the entire 5th grade of the county and came in third place overall for the competition. His parents are Donté and Holly Strickland, both of Louisburg. ALL SMILES. 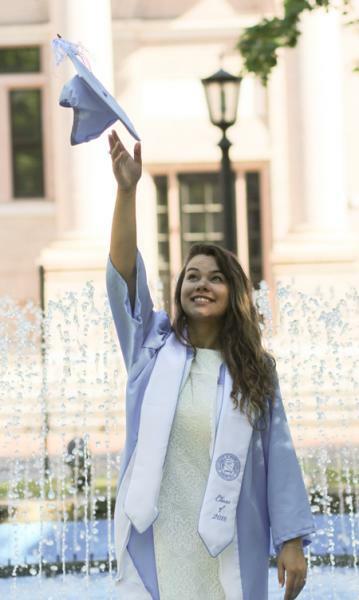 Beverly Claire Foster of the Epsom community graduated from the University of North Carolina at Chapel Hill on May 12, 2018 with an undergraduate major in Management and Society. Very proud parents are Al and Lynn Foster, and grandparents are Alton and Sandra Foster. Beverly will be starting her career in the Raleigh area. 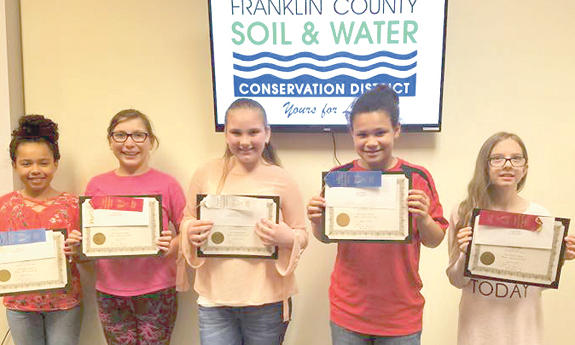 Students in Franklin County Schools were recognized recently during the 22nd annual Franklin Soil & Water Conservation District awards program. 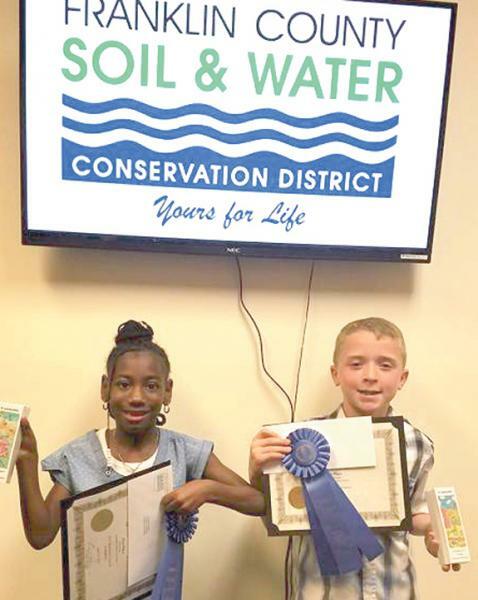 The event was held at the Franklin County Agriculture Building Annex in Louisburg and special guests were Vernon Cox, director of the NC Division of Soil & Water Conservation, Assistant County Manager Kim Denton and County Commissioner Mark Speed. Franklin County's Early College High School is well into a one-to-one initiative and it's making a difference in the classroom, school officials say. 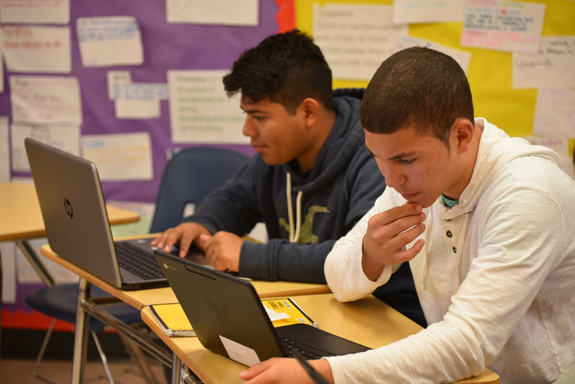 One-to-one means each student is supplied with a Google Chromebook. Students use them in class, but can also take them home. They are able to work on assignments wherever they are. 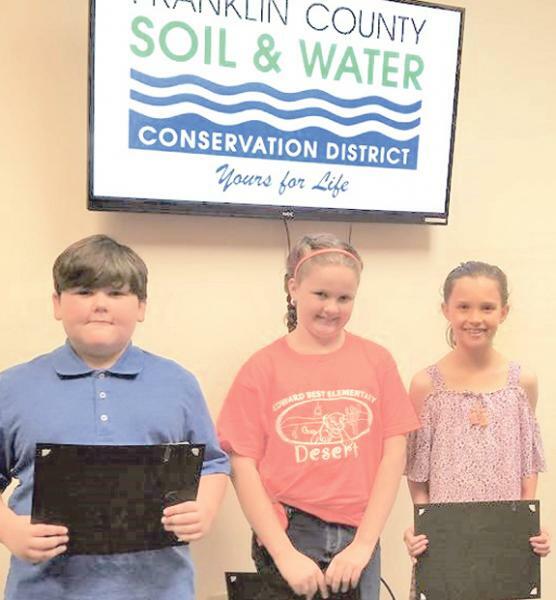 The NC Foundation for Soil and Water Conservation has announced the recipients of the 2018-19 Careers-In-Conservation (CIC) Scholarships. These merit scholarships, in the amount of $1,000 each, have been awarded to Seth Lindley Champion and Chad Matthew Kibbe, both of Youngsville. The purpose of the scholarship is to increase the number of college graduates from a North Carolina institution who are qualified for careers in natural resource conservation and other closely related fields that aligns with the mission of the local Soil & Water Conservation District. YOUNGSVILLE -- Commissioners and staff were pre-occupied with sound -- the kind that comes from a band and the kind that comes from loud mufflers. The solution to both will take some time and effort, staff said during the board's May 10 meeting. Amy Karlgut, owner/operator of Wine and Beer 101, presented commissioners with the business's plan to host a summer concert series starting in June. LOUISBURG -- Deputies arrested a Louisburg area man, alleging he was responsible for a number of break-ins at one home. Dustin Privette, 28, of Sledge Road, was charged on May 22 with two counts of breaking and entering, two counts of felony larceny after breaking and entering and one count of larceny of a firearm. LOUISBURG -- Louisburg has wanted to change the way its Alcohol Beverage Control (ABC) operation works -- and on Monday night took a dramatic step to make its plan come true. Coming out of a prolonged closed-door executive session, the council voted 5-to-1 to remove two ABC board members, pharmacist Frank Freeman and attorney Buzzy Gardner. 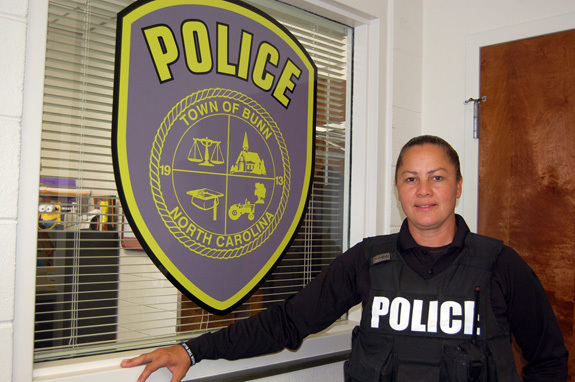 BUNN -- Town officials are hammering out a budget that includes pay raises for full-time and part-time staff, its school resource officer and a new backhoe. The 2018-19 budget proposes to spend $1.4 million and keep the tax rate nearly revenue neutral. Commissioners and staff discussed the budget during a special-called meeting Monday night. HENDERSON -- A local sorority chapter recognized women for community service, including a Franklin County resident. The Oxford-Henderson Alumnae Chapter of Delta Sigma Theta Sorority, Inc recognized Franklin County resident and retired U.S. Army Nurse Joyce Greene McLeod and four others during their 31st Annual Breakfast for M'Lady on May 12 at Shiloh Baptist Church in Henderson.